Here’s a fabulous new look to try which combines eye-catching color with expert cutting and fashion flair! The hair is heavily layered to created exaggerated volume around the crown and back. The graduations are cut with sharp textured ends to emphasize the straight lines and geometric shape of the angle moving down to just below chin-length. 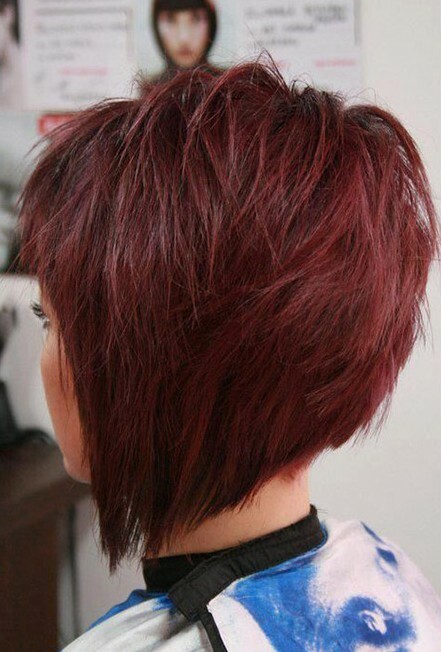 Styled across the back to create a fabulous asymmetric shape, this warm, red bob is absolutely stunning! Find more graduated bob cuts here, and more short hairstyles here .